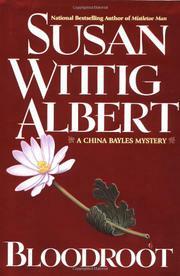 Lawyer-turned-herbalist China Bayles (Mistletoe Man, 2000, etc.) has long disowned the maternal side of her family history, distressingly connected as it is to an antebellum slave-owning plantation and her mother’s alcoholic weaknesses. But a frantic call from her mother Leatha forces her to leave her prosperous, happily married present and return to the past in the shape of Jordan’s Crossing, the ancestral home of the Coldwells, set in a lush and Faulknerian Mississippi. Leatha has been staying at Jordan’s Crossing to care for elderly Aunt Tullie, the woman who raised her, now suffering from a debilitating illness. But it’s legal, not medical, help that Leatha needs from China. For generations, the mixed-blood Beauchamps have served the Coldwells as trusted servants, accepting the racist ways of the Old South in never aspiring to land ownership. Now, however, handsome rake Wiley Beauchamp, current manager of Jordan’s Crossing, has presented Tullie and Leatha with an old property deed that appears to have granted his great-grandfather the best part of the plantation. Tullie reacts violently, and by the time China arrives, Wiley has disappeared. Soon his corpse is found on the property he craved. Now China must keep Tullie, ill and irascible, out of jail and Jordan’s Crossing in the hands of the Coldwells, all the time confronting other troubling legacies she and her mother may have no choice but to claim. Albert stretches both herself and her well-adjusted, politically correct heroine to their limits by slotting China into the role of Hamlet, haunted by generations of melodramatic Ophelias demanding revenge.